Vintage 1950’s Les Etoiles dishes made in France by Les Faienceries Continentales for the French market. The design was introduced in 1954 and looks like scattered stars in blues and yellows, bursting with energy, in homage to the atomic era of design. Backstamp reads Les Etoiles, Made in France , Faienceries Continentales, Hand Painted, Underglazed” Lots of pieces available, sold separately. 12 dinner plates available. Dishes by Russell Wright designer in American Modern and Iroquois Casual patterns, in colour Seafoam Blue, ca 1950s. All in excellent condition, priced separately. Very hard to find items included, such as the butter dish and divided serving bowl. Stainless Steel pieces made in Denmark, ca 1960’s. These card suit mugs were manufactured by the Federal Glass Co. sometime in the 1950’s or early 60’s. This pattern is very popular even today and mugs in this great condition are getting harder to find on the secondary market. Federal Glass ceased production in the 1970’s. You can identify a Federal Glass piece by the embossed F in a shield on the bottom of the pieces. You can download a $2 off coupon on the entrance fee. 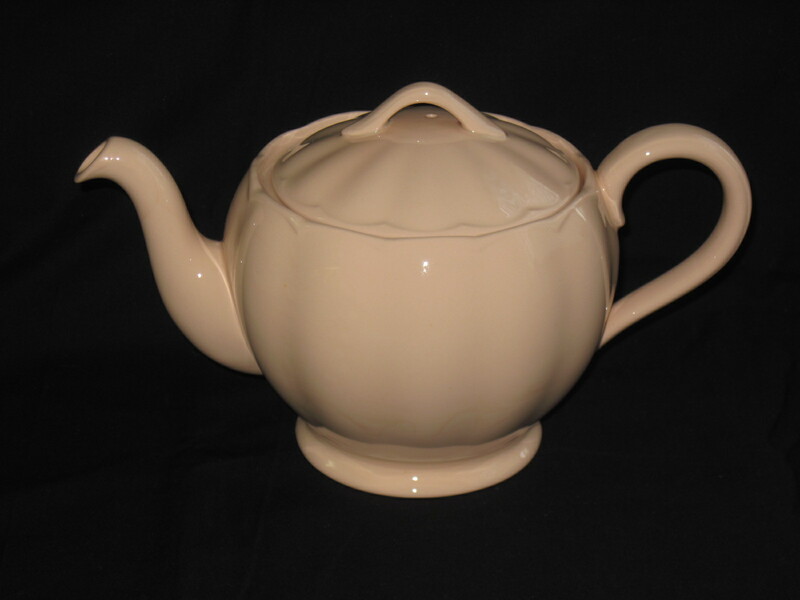 Large Peach Petal Teapot by Grindley Co. England. This particular item was produced sometime after 1954. It is in good overall condition with no chips or cracks. Some wear and darkened crazing lines on the inside. Available for sale at my booth at the Almonte Antique Market, 26 Mill Street, Almonte ON. Please note the teapot is now SOLD!!! W H Grindley was an English pottery company that made earthenware and ironstone tableware, including flow blue. The company was founded in 1880 by William Harry Grindley (b. 1859) of Tunstall, Stoke-on-Trent. The company was founded at the Newfield Pottery by Grindley and Alfred Meakin (connected to J. & G. Meakin company), but the partnership ended in 1884 and Grindley continued alone. It moved to the Woodland Pottery in 1891. William Harry Grindley died in 1926. W H Grindley was taken over by Alfred Clough in 1960, and became known as Grindley of Stoke in 1978. The company bought Ceramix in 1980, and was itself bought by Federated Potteries in 1982 before being bought back by W H Grindley in 1988. The company went into receivership in 1991 and was taken over by Woodlands Pottery. Pattern books and records from 1880-1930 are in the Stoke-on-Trent City Archives.